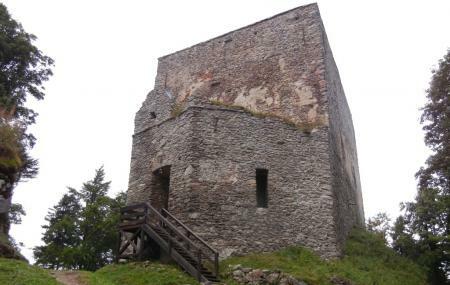 A one hour drive southwest from CeskyKrumlov will bring you to a ruined structure close to the border of Bohemia and Austria. It's a castle, and is technically still the highest castle in the country at 1053 metres above sea level. Built in the 13th century as as a fortress and administrative center, the castle saw a lot of action - the Hussite Wars, the Czech uprising. In the 18th century, it began to fall to disuse, and in the 18th century was regarded rather romantically by poets and painters. After WWII, it became a restricted military zone for a while. Do read up on a rather morbid legend associated to the castle. Renovations began in 2004. Since then, it has slowly become beloved of tourists thanks to the great views of the Bohemian Forest, LipnoNovohradské Mountains and the Austrian Alps; and also the frequent cultural events that are now organised on site. It's a popular place to get married. How popular is Vitkuv Hradek? People normally club together Kloster Erlach and Penzenstein while planning their visit to Vitkuv Hradek. Nice place. You drive on the narrow roads to the castle. Last part to the tower you have to walk. Pay a small fee to go to the top of the tower to see the amazing view. downstairs a little restaurant wit local drinks inside the tower. 500 meters from the parking, up the hill. No toilet inside. If you want to see the views from the castle, you have to pay and climb many stairs. Not so convenient with little kids.